After spending 4 months in the hospital and having to endure countless hospital meals I was looking for something super tasty. Enter Oysters Rockefeller. After searching for traditional Osyters Rockefeller recipes and keeping with my belief that everything tastes better cheese I decided on a buffalo blue cheese Oysters Rockefeller. Take a deep breath. Breathe! I know, it sounds overwhelming and it should because these little gems are heaven right here on earth. I kid you not.heaven. These beauties are great for any celebration and they totally hit the spot. 2. Shuck the oysters and save as much of the liquid as possible. Keep oysters on the largest of the half shells. 3. 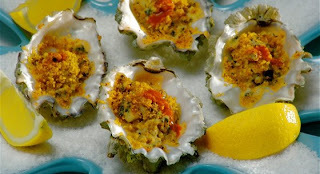 Place all of the ingredients except the oysters and blue cheese in a bowl and mix thoroughly. 4. Cover the oysters equally with the breadcrumb mixture. 5. Crumble about 1 teaspoon of blue cheese over the breadcrumbs of each oyster. 6. Place the oysters on a baking sheet trying to make sure that they stand upright. 7. Place the oysters in the oven and bake for 6-8 minutes, depending on your oven until the breadcrumbs are golden brown and the cheese has melted. 8. Serve with buffalo hot sauce and lemon wedges.